Where’s the Harm – Recycling or Disposal? Electronics in the landfill. Photo by Lya Cattel, iStockphoto. Enormous amounts of electronic products are disposed of every year, between 20 to 50 million metric tonnes, posing grave human health threats from unsafe handling of the e-waste. Most of these discarded products went to landfills or incinerators instead of recycling facilities, resulting in water and air contamination. Hazardous materials in e-waste, like lead and mercury, can leach out of landfills into groundwater and incinerating the plastics in electronics emits cancer-causing dioxins and furans. The batteries in electronic products, such as laptop batteries, also contain heavy metals that can leak into groundwater supplies once the batteries erode. Learn more about e-waste in the trash. For the approximately 20% of discarded electronics that are collected in the name of recycling, it’s estimated that between 50 to 80% of them never really get recycled, but instead are exported to developing countries, a much more profitable disposal method. In the electronic waste hubs of China, Vietnam, India, Pakistan, Philippines, Ghana, and Nigeria—which lack the infrastructure to safely manage hazardous waste—electronic components are openly burned, soaked in acid baths, dumped into rivers, or stockpiled for scrap recovery, creating serious environmental and health impacts due to the toxic lead, cadmium, barium, beryllium, mercury, and BFRs contained in the products. When many of these brominated flame retardants are burned, the emit deadly dioxin and furans, which workers and nearby residents may inhale, or which may land on crops and grass, and be absorbed via the food chain. Hazards From Recycling in the U.S.
employees had blood lead levels above 10. ● One employee was overexposed to lead in air. Two employees were overexposed to cadmium in air. Silica concentrations in air were well below occupational exposure limits. ● Lead was found on the clothing and skin of employees and on work surfaces. ● Employees were overexposed to noise. ● Employees worked in awkward positions, used forceful exertions, and performed repetitive motions. These activities can lead to musculoskeletal disorders. ● Potentially contaminated air was recirculated back into production areas. While this was just one study of one recycler, these results suggest that we need to see much more focus on health and safety issues in the recycling sector. 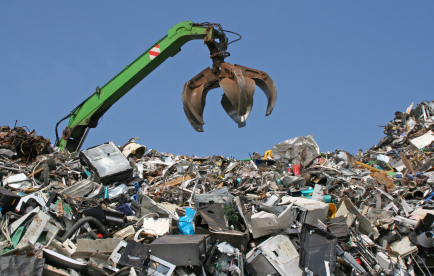 In June 2014, NIOSH released a separate report called “A Pilot Assessment of Occupational Health Hazards in the U.S. Electronic Scrap Recycling Industry.” THis was a survey of multiple electronics recyclers, to help them understand the industry, its practices, and potentials for exposures. Based on the findings of this survey, NIOSH plans to begin a new study in Fall 2014, to evaluate occupational exposures to metals and flame retardants in e-scrap recycling facilities and to recommend controls to reduce employee exposures. NIOSH is looking for five facilities that would like to participate in this study of work processes and practices, exposure controls and employee health. They will assess occupational exposures to workers at each facility, including metals (such as lead, cadmium, and indium) and flame retardants (such as polybrominated diphenyl ethers and newer alternatives). They will also evaluate engineering controls such as local exhaust ventilation, and the use of work practices and personal protective equipment at these workplaces. Findings will be posted on the NIOSH HHE Program website. Learn more about what happens when e-waste is exported to developing countries. Swedish electronics workers study, July 2014. The study looked at three “formal” recycling facilities in Sweden, comparing exposure of recycling workers to office workers at the same facility. The air sampling indicated greater airborne exposure, 10 to 30 times higher, to most metals (including lead, cadmium, mercury, and arsenic) among the recycling workers handling e-waste than among the office workers. U.S. Workers at One Recycling Facility, June 2014. The NIOSH study, “Evaluation of Occupational Exposures at an Electronic Scrap Recycling Facility,” is described above. Ghana Recycling Workers Study, Feb 2012. “Multi-trace element levels and arsenic speciation in urine of e-waste recycling workers from Agbogbloshie, Accra in Ghana.” This is an academic report that requires subscription or payment. Review of multiple epidemiological studies of e-waste workers in China. October 2013. “Health consequences of exposure to e-waste: a systematic review.” This survey found 23 studies that reported associations between exposure to e-waste or waste electrical and electronic equipment and physical health, mental health, neurodevelopment, and learning outcomes. Published in The Lancet. University of Queensland, Australia. E-waste recycling workers in India, June 2015. A study by the Associated Chambers of Commerce and Industry of India (Assocham) found that 76% of electronic-waste workers in India (many of them children) suffer from respiratory ailments like breathing difficulties, irritation, coughing and choking due to improper safeguards at dismantling workshops.